This entry was posted in Content and tagged 21st Panzer, Germans, Matilda Tanks, weapons. Bookmark the permalink. Was not the Panzergranate 40 (Pzgr.40) the APCR for teh 5cm issues from about 1942 onwards? Yes, the PzGr 40 was a tungsten-core arrowhead. But the only PzGr 41 I can find was for taper-bore guns (such as the Panzerbuechse 41). I don’t think the projectile number existed for standard guns such as the 50mm AT and tank guns. So the only explanation I have at present is that the person typing the memo made an error. The pz.gr. 38 rot was the early 75mm AP round. It is listed here http://www.lexpev.nl/downloads/geschossringbuch.pdf as the K.gr rot pz. I’ve seen it called the m. 38 AP round other places. It probably was used as a stop gap until production of the improved normal round could be ramped up. The normal 7.5cm Pzgr was the Pz.gr. 39. The Panzerbuechse 41 probably was the 7.5 cm Pzgr 41 (HK) an arrowhead style APCR. In March 1942 I would guess the Germans were in the process of testing the new 75mm PaK 40 and used the Matilda II as target to see what it could do. It saw quite heavy use in North Africa during the period. I am not aware of any deliveries of the Pak 40 to North Africa by early 1942. There were the 7,5cm Pak installed on the two prototype half-tracks. This is interesting if a puzzle of sorts. I would assume that it is a ‘field shoot’ and in theatre. I think it is a test of the APCR (Pzgr 40 models) and other ‘best of’ weapons against the Mark II (perhaps obvious). The explanation I can think of, for the 5 cm ammunition, is that they have two models of the Pzgr 40. That is, Pzgr 40 and Pzgr 40/1. These are similar and can be viewed in the link Mobius provided. It is a clerical mistake most probably. Both 5,0 cm Pzgr 40 and Pzgr 40/1 had ausf (variants) but that may mean materials. All used the same ‘bolt’ of 21mm Tungsten carbide, but the main difference is the weight overall of the projectile, and the resulting velocity. The 2.8cm is the squeezebore weapon as has been described. The Pz. Gr 38 is an early HEAT round for the 7,5 cm KWK . 7.5cm Pz.Gr. is actually the K. Gr. Pz Rot early 75mm large capacity (0.08 Kg explosive) armor piercing round. There were no 7,5 cm Pzgr 39 at this time. I am not sure if the Germans actually did use the 7,5 cm Pzgr 39 on the short barreled 7,5 cm KWK 37 weapon, or if made much of a difference at the velocities it achieved in those short weapons. If this is a Field shoot, and given the date, there are no Pak 40’s in theatre. They don’t have KWK/StuK 40 weapons either. This weapon was canceled once the Germans engaged the T-34/KV tanks. It fired the same early K. Gr. Pz Rot as the L24 weapons. The Germans clearly needed a better projectile (Pzgr 39), and velocity. The ‘L41’ had a shorter cartridge and as far as anyone knows, these halftrack vehicles were the only use/field trials. Yep. That’s my understanding too. Quite a few oddities ended up in North Africa (the Dianas are another one). Yes, the rare Diana actually used a ‘stock’ Soviet F-22 weapon. that is, used either stock Soviet ammunition or the German equivalent. It was not a reworked weapon like the 7.62 cm Pak 36 that fired the German ‘Pak 40’ brass with German 7.62 cm Pzgr 39. 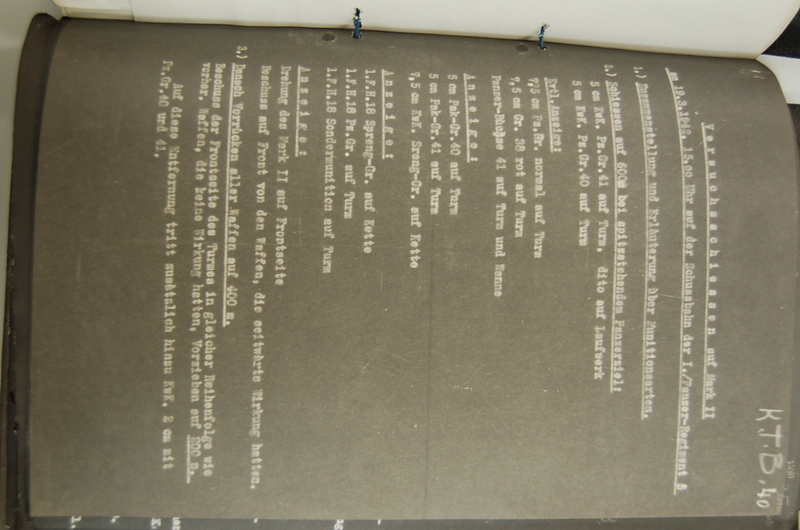 Also, a small detail, but the report does call out both KWK 5,0 cm weapon (tank) and the 5,0 cm Pak 38. At that time, the Panzer III would have both L41 and L60 versions of the 5,0 cm KWK. The Pak 38 was only L60. My understanding is that the L41 weapons did not get much improvement from Pzgr 40 type ammunition. Some reports claim that the cartridge brass would even split, jamming the weapon during a firefight. The test was held on 19 March. They would just before have received the Panzer III with the L60 gun, and the vast majority were still the L42 model. I don’t have a better breakdown than the one on the other table you commented on. They didn’t receive 37mm versions. Hello, just wanted to make a comment the choice of the type of depending ammunition of the servants of the weapon, since the penetration dependered the angle of impact. The “break down and drop out” of luck in the impact or the experience of the crews. I think the mark II was designed as an infantry tank, their specific use was to raise positions and for that the germans had a formable frame both at the municion level and at the operational level for the election of the white at distances between 1500 and 1000 meters.